The Family Deal: It’s not just what you get, it’s how you feel! Although every reasonable effort has been made to ensure the accuracy of the information contained on this site, absolute accuracy cannot be guaranteed. This site, and all information and materials appearing on it, are presented to the user “as is” without warranty of any kind, either express or implied. All vehicles are subject to prior sale. The Family Deal Price reflects FCA Employee Purchase Pricing. You must qualify for FCA Employee Pricing to obtain this price. New vehicle pricing includes all offers and incentives. Tax, Title and Tags not included in vehicle prices shown and must be paid by the purchaser. While great effort is made to ensure the accuracy of the information on this site, errors do occur so please verify information with a customer service rep. This is easily done by calling us at (866) 627-8054 or by visiting us at the dealership. **With approved credit. Terms may vary. Monthly payments are only estimates derived from the vehicle price with a 72 month term, 4.9% interest and 20% downpayment.Monthly payment calculator is an estimate and does not include tax, $15 title, license or $220 doc fees. 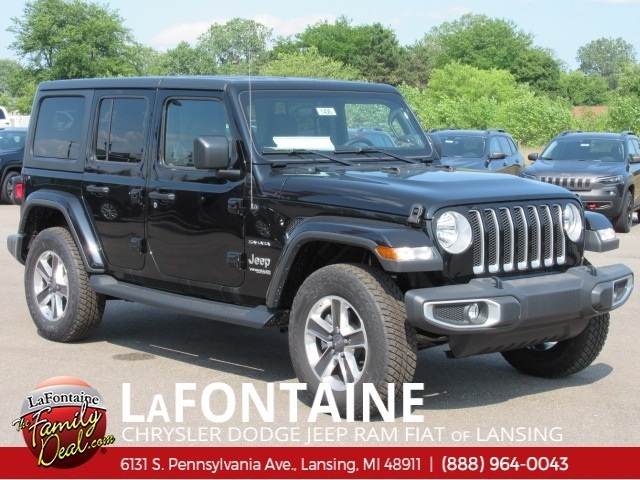 2018 Jeep Wrangler Unlimited Sahara Wrangler Unlimited Sahara, Black Clearcoat, 8 Speakers, Alpine Premium Audio System, Black 3-Piece Hard Top, Freedom Panel Storage Bag, Garage door transmitter, Heated Steering Wheel, Radio: Uconnect 4C Nav w/8.4" Display, Rear Window Defroster, Rear Window Wiper/Washer, Remote keyless entry, Remote Start System, Steering wheel mounted audio controls. Priced below KBB Fair Purchase Price! 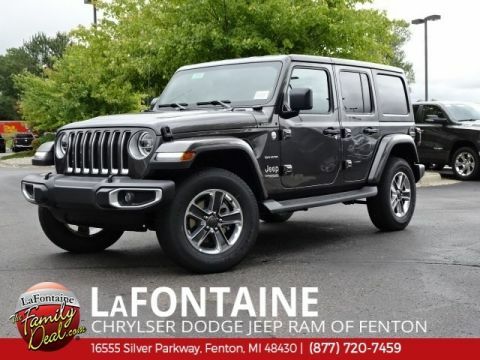 Welcome to LaFontaine Chrysler Dodge Jeep Ram of Fenton, home of the family deal. 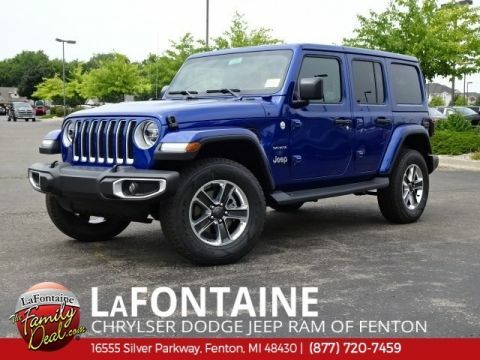 At LaFontaine, our mission is to build lifelong relationships, connect families, strengthen communities, and personalize the automotive experience. With LaFontaine’s Family Deal, it’s not just what you get, it’s how you feel. Our core values are: accountability, responsibility, respect, communication, teamwork and passion. 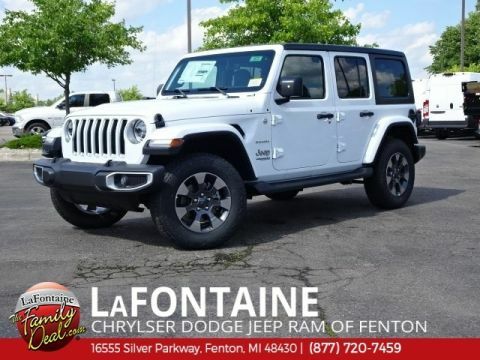 LaFontaine Chrysler Dodge Jeep Ram of Fenton	42.7960537, -83.7376304.